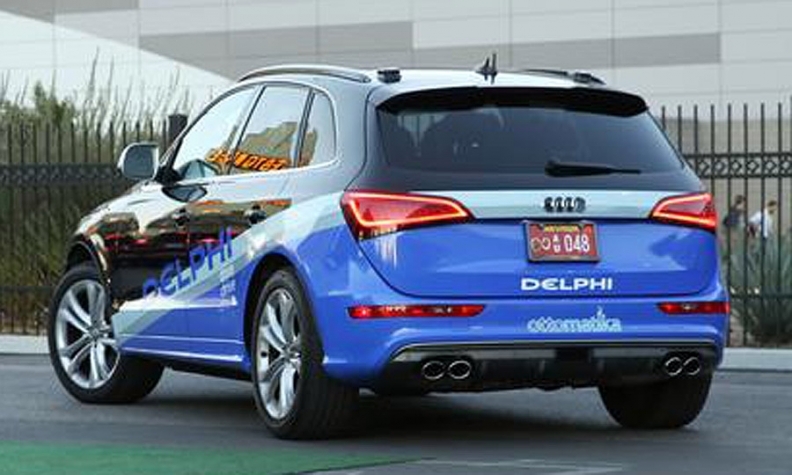 Delphi will use the coast-to-coast drive to test such functions as traffic jam assist, automated highway pilot with lane change, and automated parking and valet. DETROIT -- Delphi Automotive aims to demonstrate its growing prowess in self-driving cars with what it bills as the "longest automated drive ever attempted in North America" -- a 3,500-mile coast-to-coast excursion in a specially rigged Audi SQ5 that will mostly drive itself. Delphi, one of the largest suppliers of automotive electronics and safety systems, is using the long journey in the Audi crossover to acquire real-world data from a sophisticated array of cameras, radar and lidar -- a laser mapping technology -- as well as wireless connected-vehicle technology. Delphi also wants to test and demonstrate its active safety systems, which are being developed with such suppliers as Mobileye NV, an Israeli maker of computer vision and collision avoidance systems, and software provider Ottomatika, a spinoff from Carnegie Mellon University's self-driving car program. Delphi's demonstration underscores growing interest and investments by automakers and suppliers in self-driving cars, some of which could be production-ready by 2020. The Delphi drive will kick off March 22 near San Francisco's Golden Gate Bridge, with plans to wind up in New York City just before the city's annual auto show opens there on April 3. Jeff Owens, Delphi's chief technology officer, sees the automated driver assistance systems in the Audi as building blocks on the road to fully self-driving cars in the next decade. Although automakers and suppliers will have such capability within the next five years, Owens said, "our view is that the driver is going to be in the seat for a long time" in case of emergency situations that self-driving systems may not be equipped or programmed to handle. During the coast-to-coast journey in the Audi, at least two Delphi engineers will be aboard, including one behind the wheel. Delphi, a former unit of General Motors and now based in the United Kingdom, will test such functions as traffic jam assist, automated highway pilot with lane change and automated parking and valet. All of those systems are expected to be introduced in production cars over the next two to three years. Fully automated systems that may be phased in after 2020 could add about $5,000 to the cost of a car, estimates Glen De Vos, vice president of advanced and product engineering for Delphi's electronics and safety division. Delphi is providing some of the components and technology, including vehicle-to-vehicle connectivity, for GM's Super Cruise automated driving system, which will debut in 2016 on the new Cadillac CT6 sedan.